Meme-Inspired Writing Activities, Part I | Create. Communicate. Connect. Thanks to the great fun and greater conversation going on at Making Learning Connected, this week I’ve had memes on the brain. Ever since I made my first-ever memes to compliment my last post, I’ve been convinced there’s a writing game in there somewhere. Well, I’m excited to say that I’ve come up with not just one, but three fun and easy ways to incorporate memes into various parts of the writing process! In this post I share the first, an idea generating activity that explores character development and conflict. Examples generated from the Meme Sticky Note Method. Select a meme with a formula that’s beneficial for exploring character. 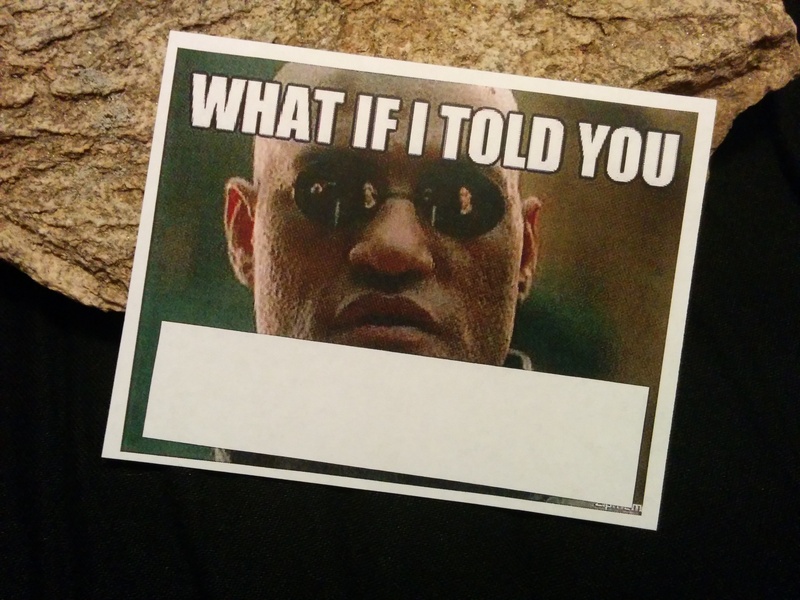 For example, the Morpheus meme, “What if I told you…” is a great meme to use if you’d like participants to explore character through the lens of ‘mind-blowing’ secrets, fears, or desires. Or, the Futurama Fry formula of “Not sure if…/ Or…” is fantastic for having participants explore a character in conflict, torn between two choices. 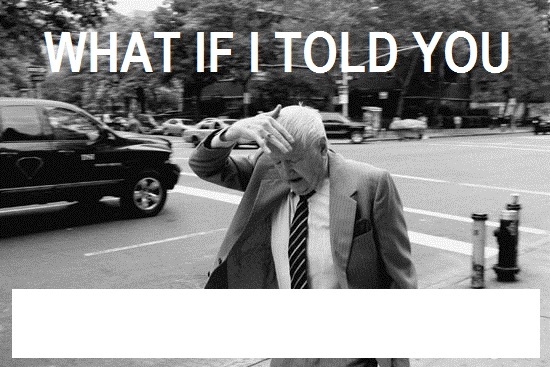 …that a writing activity using memes is possible? Do a ‘Meme Sticky Note’ Method. Make small print outs of the original meme, placing a blank box wherever you’d like participants to fill in text. 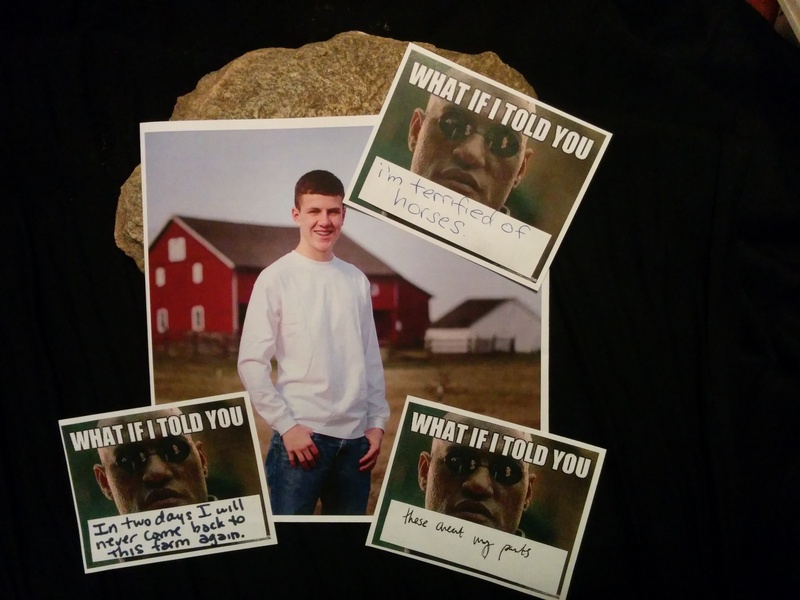 You can see my example using the Morpheus meme in the photo to the right. To find meme sticky note templates for the Morpheus meme and the Futurama meme, visit my Flickr here. Make a “gallery” on the walls by taping up the photos you’ve selected. Have participants use the meme notes to post imaginary information about the person in the picture. For example, if participants are using the Morpheus meme, instruct them to write a “mind-blowing” fear, secret, or desire for each individual. (Two great questions to ask as prompts are, “What are fears, secrets, or desires you would expect this individual to have just by looking at him or her?” and “What are fears, secrets, or desires you wouldn’t expect this individual to have just by looking at him or her?”) Have the participants post their notes next to each corresponding photograph. 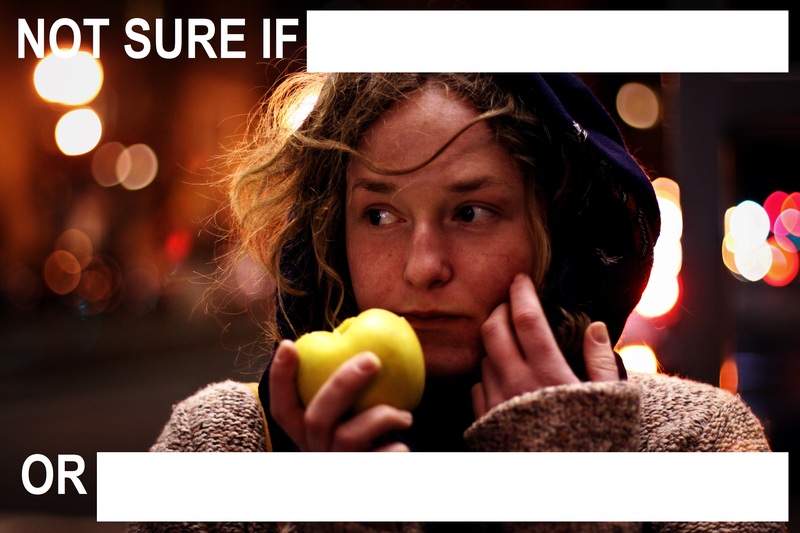 Ask participants to stand by the photograph that resonates with them the most. Then, instruct them to choose a meme note that is not their own that interests them as a writing prompt. Let the writing begin! If you think it would help your participants, you can give them a required first sentence or a required first line of dialogue. Based on the Morpheus meme. Take the framework of a meme, and impose that framework on the photo(s) you have selected. Place a blank white box wherever you’d like participants to fill in text. Here are two examples. The one on the left uses the “What if I told you…” Morpheus framework, and the one below uses the “Not sure if…/Or…” framework of the Futurama Fry meme. Based on the Futurama Fry meme. Spread out photographs you’ve selected, and let each of the students choose the photo that resonates with them. Or, have all participants focus on the same photograph, and pass out a copy of that photograph to each participant. Once all the participants have filled in the blanks, have them make a “gallery” on the walls in by taping up their photos. Have participants stand by a meme portrait that is not their own that interests them as a writing prompt. More than one student can choose the same portrait. Select a meme with a formula that interests you as a possible way to explore character, such as the Morpheus meme or, the Futurama Fry meme. When you’ve selected your photograph, set your timer for 1 – 3 minutes and make a list of all the possible ways you can think of to fill in the blank(s) of the meme for this character. To keep the ideas flowing, think about ways to finish the meme that focus on what the character says, does, feels, or desires. Then, think about the ways to finish the meme that focus on the character’s social, economic, political, or cultural style. Most of all, be sure to think of answers that you would expect of this character just by looking at him or her, as well as answers you would not expect. When time is up, read over your list and circle any of your responses that interest you as a writing prompt. Narrow your choice down to one. I hope you enjoy this activity! Remember, whenever I post an activity, prompt, or guiding writing exercise in the Support For Writers section of my site, I will always write a blog post about the activity as well. That way, if you follow my blog you’ll always know when new exercises become available. Feel free to get your own creative juices flowing by filling in the blanks of either of the two meme portraits by commenting below!